Spicy Butternut Squash Chili | Vegan, Gluten-Free, and Oh-So Spicy! 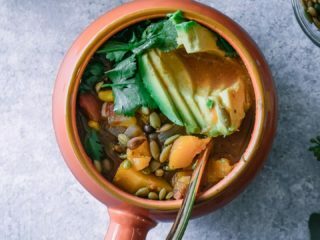 Spicy Butternut Squash Chili, a simple vegan and gluten-free autumn vegetable chili featuring butternut squash, black beans, diced tomatoes, and topped with avocado and cilantro. 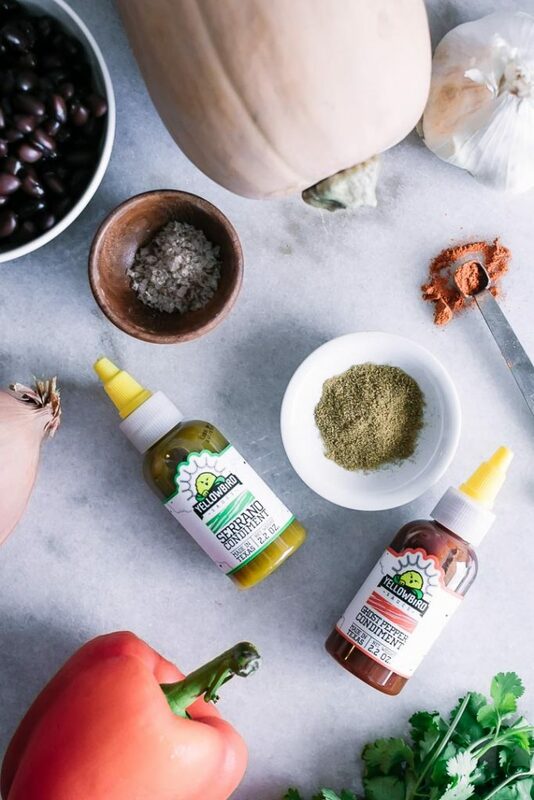 Add spice with Yellowbird Hot Sauce for a spicy kick! This post is sponsored by Yellowbird Hot Sauce; you can learn more by visiting my disclosure and privacy policies. Thanks for supporting the brands that make Fork in the Road possible! Chili, the quintessential cold weather cozy comfort food (say that five times fast). Loved by all, fiercely debated (have you every attended a chili cookoff? It’s cutthroat), and too many possible variations to choose from. Chili is delicious any time of year, but in the cold weather months you want your chili spicy. A delicious spicy chili is one that will have you wishing for seconds, but also wishing for mercy…because the spice is almost too much. Almost. That’s why when Yellowbird Hot Sauce reached out to do a recipe collaboration, I knew it had to be a chili. Their fun and funky array of hot sauces were perfect for a build-your-own chili bar with a beautiful array of toppings that lets each person add hot sauce to their own spice tolerance level. Yellowbird is doing hot sauce differently; their condiments are made without fillers and from all-natural fruits and vegetables, so I knew they’d be a perfect fit here on Fork in the Road. 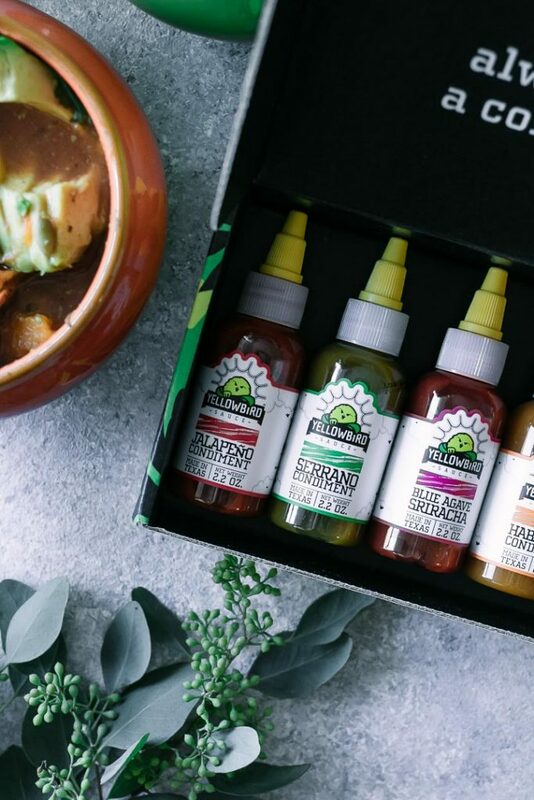 Want to score yourself some spicy Yellowbird sauces? Check out the Yellowbird shop page or enter your zip code to find a store near you! 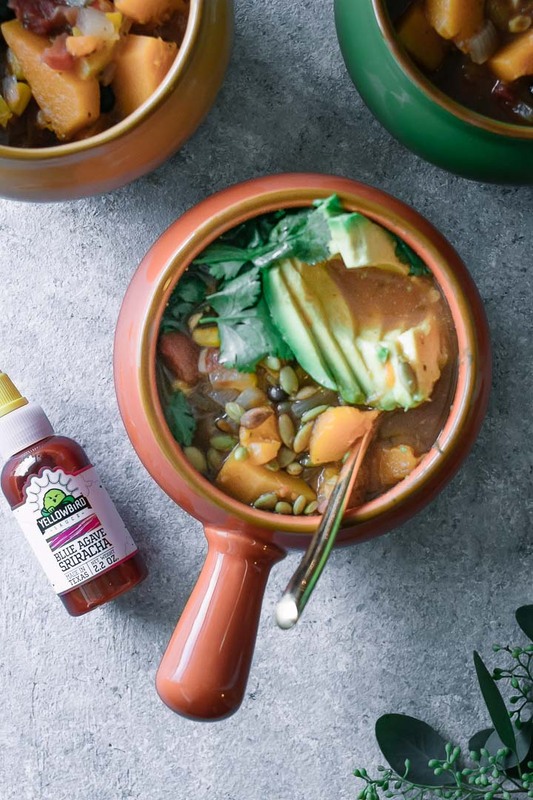 Ready to find out how to make this so-easy, ready in under 60 minutes, vegan Spicy Butternut Squash Chili? Let’s do it! 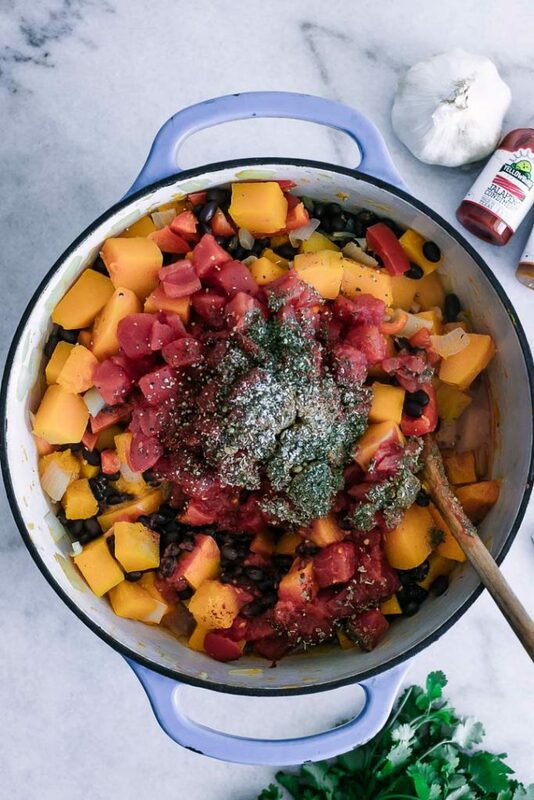 This butternut squash chili recipe is a super easy fall-inspired take on traditional and, other than spending a few minutes prepping vegetables, is very hands-off. The first step is to prep and cut the vegetables. Peel, de-seed, and cut the butternut squash and dice then onion, then saute them in a large soup pot over medium-high heat. Next, add the minced garlic, can of diced tomatoes (or use fresh if you still have tomatoes in season! ), corn, and black beans. Then add your spices and simmer the soup for 30 minutes, or until butternut squash and other vegetables are soft. When the soup is done simmer is when the magic happens: pick your favorite flavor of Yellowbird Hot Sauce and add dash or two (or five) until your desired spice level. I love to sweat when I eat chili, so I did about ½ teaspoon. Then top your chili with your favorite toppings — avocado, cilantro, squash seeds, cheese, etc. — and enjoy! I hope you enjoy this easy butternut squash chili recipe! 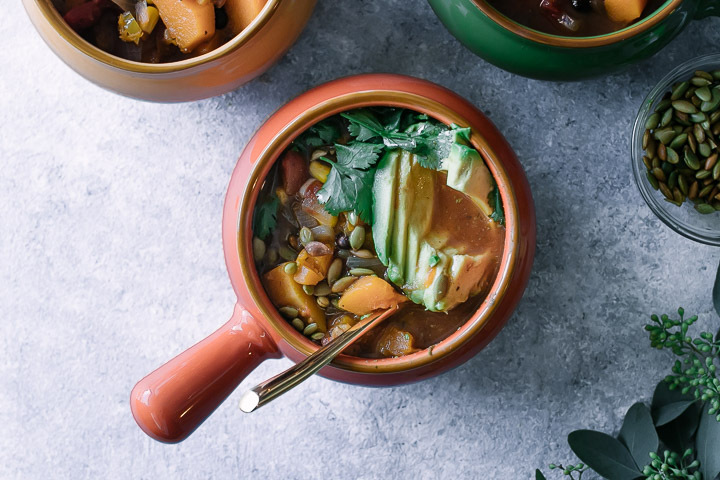 For more easy fall-inspired soups and stews check out our Instant Pot Pumpkin Sage Soup and Creamy Vegan Roasted Butternut Squash Soup recipes, both plant-based comfort foods that are perfect for chilly nights. 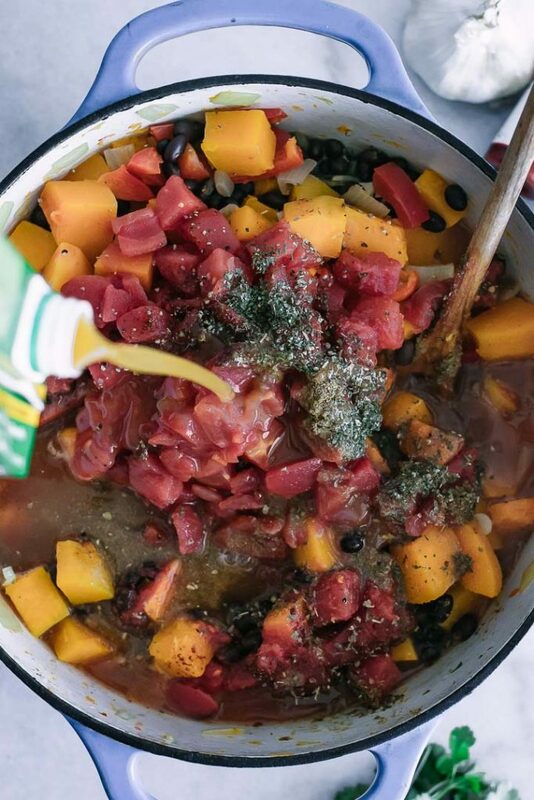 Did you make this Spicy Butternut Squash Chili recipe? Leave a comment below and rate the recipe to let us know how it turned out. Save this recipe for later by pinning to your favorite fall Pinterest board and make sure to tag me on Fork in the Road’s Instagram to show me your chili creations! 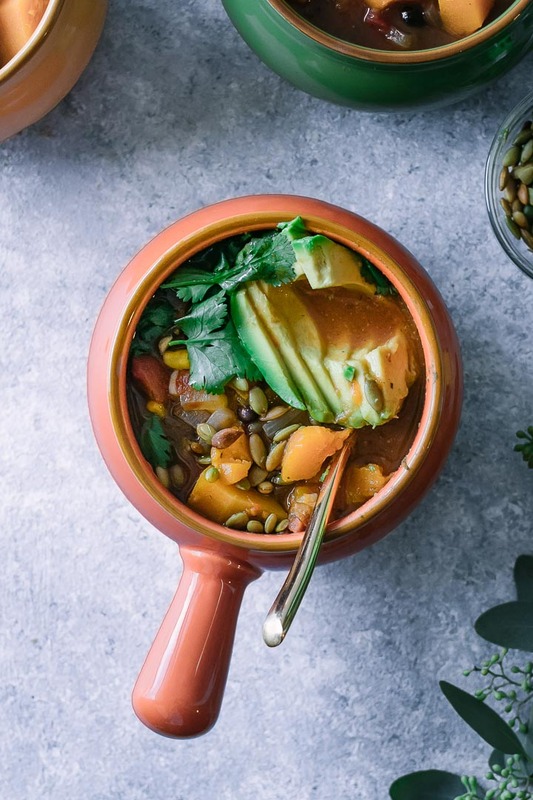 Spicy Butternut Squash Chili, a simple vegan and gluten-free autumn vegetable chili featuring butternut squash, black beans, diced tomatoes, and topped with avocado and cilantro. Heat oil over medium heat in a large soup pot and add butternut squash and onions, sautéing until onions are soft, about 5 minutes. Add garlic and bell peppers and cook until soft, about 5 minutes more. Add diced tomatoes, corn, black beans, cumin, chili powder, oregano, coriander, salt, pepper, and vegetable broth to pot and simmer on medium-low heat for 30 minutes. Add hot sauce and stir to combine. Serve topped with toppings of choice. Notes: If you’d like to make this vegetable chili less spicy, add ancho chile and hot sauce at the end before serving. Leftovers and storage: This butternut squash chili recipe is a great make-ahead recipe because it tastes even better as leftovers. When chili is done and has cooled, store it in an airtight container in the refrigerator for up to five days, or freeze for up to two month (or longer). Nutrition: This vegan chili recipe is a good source of plant-based proteins because of the beans, and a good source of fiber per serving. It is also high in vitamin C and iron. This was delicious! I just happened to have all of the ingredients on hand so I threw them together in a pot and my family loved this. I froze the rest because we’re going out of town, hoping its still good when we get back and heat it up. That’s great! It’s become our new favorite soup, we’ve had it at least twice a week for the last two weeks. Enjoy!